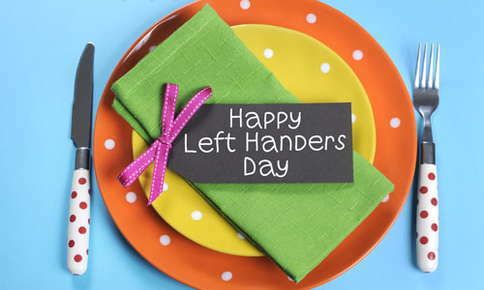 Left-Handers Day, celebrated on August 15th, was launched in 1992 by the Left-Handers Club, an organization based in the United Kingdom. Since then, Left-Handers Day has become a worldwide event and social media phenomenon. Around the world, approximately one in ten persons is left-handed. But we live in an overwhelmingly right-handed environment, the most notorious example of which is the traditional schoolroom desk with the writing surface attached to the right side. Left-handers, familiar since childhood with the necessity of overcoming various mechanical and furniture-related obstacles, may derive comfort from the fact that they are perceived as unique, different, and gifted with more intelligence and creativity than the average individual. Famous left-handers in the arts, sciences, and political arena include Aristotle, Leonardo da Vinci, Friedrich Nietzsche, Michelangelo, Vincent van Gogh, Isaac Newton, Julius Caesar, Barack Obama, H.G. Wells, and Oprah Winfrey. As with all life skills, talents, and abilities, one's creativity is assisted immeasurably by ongoing health and wellness. It is certainly possible to succeed at a high level despite chronic illness, but long-term health makes more energy available on a more regular basis to help facilitate the creative process. Long-term well-being is established by the consistent lifestyle choices of good nutrition, regular vigorous exercise, and getting sufficient restful sleep. Good nutrition is provided on a daily basis by eating foods from the four major food groups, that is, healthy protein, whole grains, fruits, and vegetables, as well as consuming healthy oils and plenty of water each day. Regular vigorous exercise consists of both cardiovascular and strength training routines, done for at least 30 minutes five days a week. Regular chiropractic care assists all of us, ourselves and our families, to participate fully in these healthful lifestyle activities. As well, regular chiropractic care provides a long-term boost to our creative faculties. By helping to improve the performance of our nerve system, our body's master system, regular chiropractic care facilitates the flow of information from the brain to the rest of the body and back again. In this way, regular chiropractic care helps ensure open channels of nerve conduction and helps enhance the creative process. As a result, everyone, left-handers and right-handers too, can achieve greater fulfillment of our creative potential and flourishing as human beings. "I have benefited tremendously from the chiropractic care I received from Dr. Jon Bafford."